The REAL HOPE program is a values based, peace nonviolence and anti-bullying program. REAL HOPE is an acronym for: Responsibility, Empathy, Awareness, Love, Honesty, Oneness, Peace and Enjoyment. REAL HOPE is a program where life skills, emotional intelligence, positive psychology and peaceful behaviours are developed and integrated over a 8 week program. The children develop an understanding and experience of peace through brainstorming and critical thinking, humour (positive thinking), philosophy (inquiry), experiential activities (integration), stimulatory materials (DVD, audiovisual, props), meditation (visualisation, calm) and reflections in the home environment to integrate peaceful values as real life skills to produce peaceful behaviours. Children will develop pro-social behaviour, heightened emotional intelligence, an awareness of choices between division and unity, how values affect what they see and how they treat others and that when we all work peacefully together we can experience happiness and a shared sense of community. It is expected that peaceful behaviours will deepen and bullying will reduce as a result of raising awareness and understanding, developing strategies, integrating values and the resultant empowerment. REAL HOPES is an acronym for Responsibility, Empathy, Awareness, Love, Honesty, Oneness, Peace, Enjoyment and Service. The last value is the outcome of integrating the previous 8 values. It is a new model that is framed by values and when integrated produces peaceful attitudes and behaviours. The REAL HOPES model is a process of lateral values useful for problem solving and approach problems from a values perspective first. The model opens up emotional intelligence to discover empowerment and courses of action. 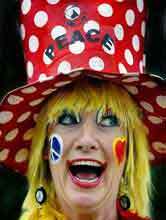 The videos are for educators and demonstrates Peacefull the clown teaching values to children. The video overviews each value, excerpts from educational activities and what children will gain from each session. The children were filmed at Thomastown Primary School in Melbourne, Australia. This was a multicultural school. The video runs for 10 minutes. Video’s are available on Youtube also. The REAL HOPE program runs for 8 weeks to ensure deeper integration of values.